On the way to a new country, besides discovering its culture, one of the most well-worth and exciting things that you absolutely cannot miss is spending time drinking alcohol with your beloved partners. In Bhutan, beer culture is rapidly growing then people here are trying to create a taste for ingenious craft beers along with flavors which have been already sought after strong beers. So, you have varied types of beer in Bhutan now to high on life. Do not waste your time anymore, there is a list of 7 Bhutan beer brands to try for you while enjoying a Bhutan vacation. 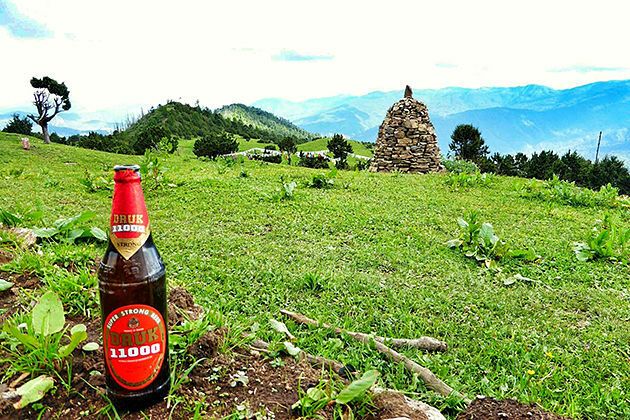 The oldest beer brands in Bhutan, Druk 11000 is the most popular among local dwellers mostly due to its unique flavor of strong beers that are made with the Himalayan spring water allowing drinkers to have a refreshing feel after taking a sip. With each whopping 650ml beer bottle with 8% alcohol content, you can get a slightly high on a hot day. There are two other lighter options for you – the Druk Lager contenting 5% alcohol and the Druk Supreme. If alcohol beverage is your thing during a Bhutan vocation, the Druk 11000 will satisfy you a lot. A fairly new flagship brewed by the beer factory-Ser Bhum Micro Brewery, the Bhutan Glory-Amber Ale, somehow, spreads its popularity like the wildfire among the locals and foreigners. Perhaps being named after a feeble species of butterfly, this Bhutan craft beer is lighter than others with 5% alcohol content. The taste of this beer brand mainly comes from Munich and Victory malts as well as malt caramel whiff. To make it have a bitter taste and deeper color, an amount of Magnum hops and Crystal malt are used respectively. One of the Bhutan dark beers, Dragon Stout itself brewed with roasted barley and to give it a deeper dark color, an amount of chocolate malt are added. Its bitter flavor is balanced by supplementing Crystal malt to give a slightly sweeter taste. The name of this beer brand is based on the way Bhutanese referring their country as Druk which means land of the Thunder Dragon in Dzongkha. For one who is a coffee lover, this Bhutan beer can be your thing giving you a taste of bitterness. A new strong beer which has recently been launched by Kinjore Brewery, however, it is quickly gaining lots of popularity in a very short term. 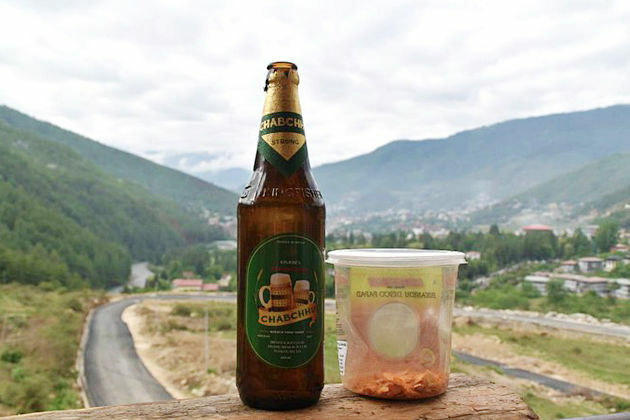 The Chabchhu is a beer brand of both the locals and foreigners’ choices as they can easily get high with every 650ml beer bottle with 8% alcohol content. Dragon Frost and Thunder 15000 are the two other beer products of the Kinjore Brewery. Another dark beer in Bhutan, Dark Ale launched by the Namgay Artisanal Brewery is well-known as “farmers’ beer” due to its brewing components purely come from local farms. The husk of barley, an ingredient of this Bhutan beer is considered to be useless and tended to be thrown out, but it is the indispensable one of the Dark Ale. Besides, extra imported malts are added to the beer too. The Red Rice Lager is another product of the Namgay Artisanal Brewery and is also known as the flagship of this Bhutan beer factory. Its name, somehow, let you know the main ingredient of this beer brand– red rice which is used to brew this beer in Paro. 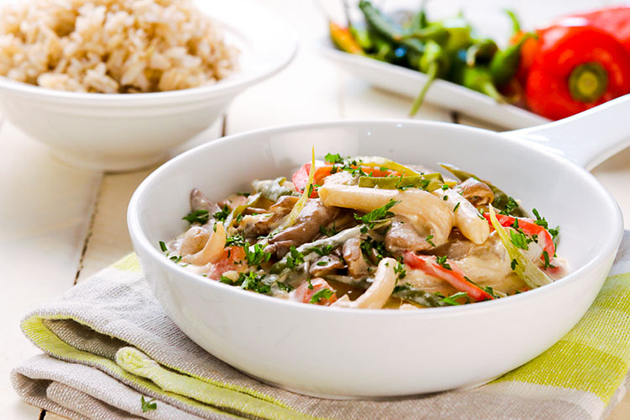 The taste of the Red Rice Lager is quite nutty which resembles the familiar Bhutanese palates that they get used to – red rice. If you are a craft beer lover; then try this Bhutanese beer as it will exceed your anticipation. 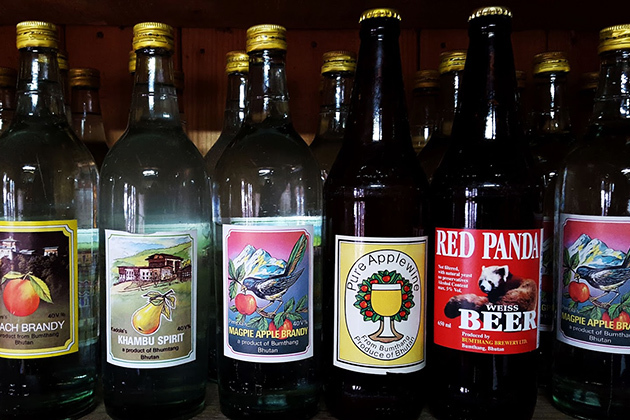 Carefully brewed without adding any preservatives and being filtered, the Red Panda Beer is produced by one of the oldest breweries and only one in Bumthang. Its owner, a Swiss gentleman is also own a cheese factory in Bumthang; therefore you can completely have the best time on a hot day with the two products.